Having to deal with unwelcome pests or animals in your home is bad enough, but another layer of threat and complication when disease is added to the picture. The threat of disease from household pests is well-established and probably more prevalent than you think. There are a host of diseases that can be passed on from pests to humans, from viruses, Lyme disease, and probably a few you never heard of. The first step to combating these threats is awareness, followed by prevention and/or corrective action. Your home can be an inviting atmosphere for unwelcome animals or insects no matter what climate you live in. Thus, if you think you are safe without having done any pest-proofing, you may want to think again. When you think of disease and pestilence, birds might not be the first animals to come to mind. However, birds are known to harbor harmful bacterial pathogens. Some of these diseases are transmissible to humans, so hearing some fluttering or squawking in the attic or garage ought to warrant some concern. There are various methods you can employ to help get rid of birds. You may want to think about purchasing a lifelike replica of a natural predator to the particular species you are dealing with. For example, if pigeons have taken up residence in your garage, consider placing an owl or hawk nearby. Some people even hire handlers to bring real hawks around the area to scare off the birds. Other methods may include placing nets around gardens or utilizing reflective surfaces to scare them away. Shiny, reflective surfaces tend to deter birds from roosting nearby. Otherwise, you can sprinkle spices, like black pepper or cinnamon, which repulse birds. To prevent birds from getting too comfortable at your house, cover up any points of entry and never provide them with food of any kind. If they find a reliable source of food in your garbage or garden, they will be more likely to stick around. These insects are notorious home invaders, and potentially carry disease with them. These insects are common in urban environments and have been shown to increase asthma morbidity. This is because the saliva, feces, and shedding parts are inhaled and irritate the immune system. These bugs can also climb into garbage and sewage and then track bacteria over countertops or other surfaces that come into contact with food. To prevent a cockroach infestation, make sure you are properly disposing of waste. This may involve regularly sweeping and vacuuming kitchen areas and not letting full trash bags linger in the house any longer than they have to. Roaches like warm, damp areas so check these areas and make sure there are no points of entry. There are various plants that can help fend off roaches, such as catnip. There are various compounds contained within the plant that help to repel the pests naturally. Rats are notorious for their ability to wreak havoc in an otherwise orderly household. They are larger and stronger than mice and thus can chew through insulation and other surfaces far more quickly. They can also cause fires by chewing through electrical cables. They can also breed quickly, which means a small problem can quickly become a far greater one if left unattended. Rats are well known to harbor disease, as they absorb pathogens from their environment and spread them. They can also carry drug-resistant strains of bacteria due to their constant exposure to them. Many of these diseases, including MRSA, can be passed on to humans and potentially cause serious illness. For maximum effectiveness, it’s best to act on the problem as soon as you suspect there is one. Rats are nocturnal, which means most of their activity will be between sunrise and sunset. Rat droppings are usually found in concentrated areas, and resemble a large, brown grain of rice. Signs of chewing are hallmarks of rats, as they have teeth that continuously grow and need to gnaw to keep them in shape. There are various methods to get rid of rats. Using traps is one of the tried-and-true methods of quickly eliminating members of the population, with peanut butter and cheese recommended as the best bait. Adding boric acid to the peanut butter increases effectiveness. Other methods of deterring rats involve peppermint oil, onions, peppers, or bay leaves. Substances in these items repel the rats via varying mechanisms. You can also consider placing owl feathers or human hair near rat holes. Rats detect the feathers and hair as signs of a natural predator and are repelled. Cats can also prove worthy adversaries for rats, as they too are natural predators. Sometimes the mere smell of the cat litter is enough to chase the rats away. 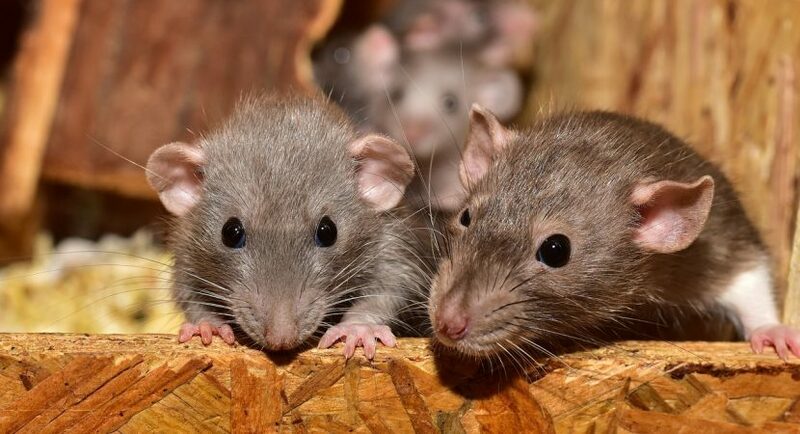 However, rats are sometimes infected with a parasite called “toxoplasmosis”, which hijacks their nervous system and makes them attracted to cat urine. Since you don’t know what the rats may be carrying, a multi-pronged approach is best.